Kris Furr | Yuma's Best Professional Sports Event! Kris Furr is a 26 year old American rodeo bullfighter from North Carolina. Kris grew up in North Carolina’s Yadkin Valley, but now resides in Statesville, NC. Growing up in a rodeo family Kris always had his eyes on the sport of rodeo, particularly bullfighting. At the age of only 10 years old Kris stepped into the arena at a youth rodeo in Sparta, NC with the ambition of being a bullfighter and never looked back. Kris has found a lot of success in the sport on the amateur level. In 2013 he decided it was time to take his career to a higher level by going pro and joining the PRCA. 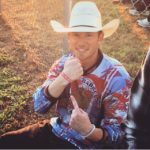 Like many rodeo bullfighters in the PRCA Kris’s ultimate goal is to work the National Finals Rodeo (NFR) in Las Vegas, rodeos version of the super bowl.